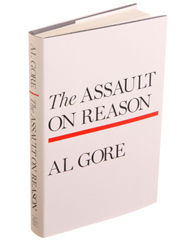 There’s a couple of must read posts regarding the White House’s attack on Al Gore’s newly released book, The Assault on Reason. Think Progress has Tony Snow’s claim that Gore is wrong in saying that the Bush administration had made false claims of a connection between Saddam and the 9/11 attacks. Multiple links are present which verify Gore’s charges and contradict Snow’s claims. James Boyce reports on a conference call between bloggers and Gore. Taylor Marsh also has a report, as well as the full audio up. The New York Times reviewed The Assult on Reason yesterday. Maureen Dowd discusses it in today’s column, but unfortunately is far more concerned with Gore’s weight than anything of substance. As the column is behind the firewall I indended upon presenting a section, but I really don’t find anything worthy of quoting in today’s column. Posted in Al Gore, Blogs & Social Media, Op-eds. Tags: 9/11, Al Gore, Maureen Dowd. RSS feed for comments on this post.. TrackBack URL.